Today begins a new journey at sea--the one place in this world that I feel most content. The photograph above sums up my definition of peace, tranquility and splendor. 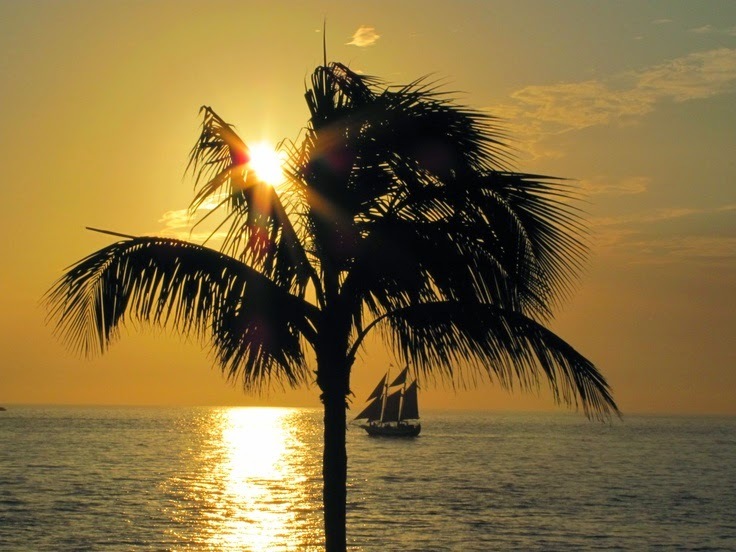 I was so blessed to capture this Key West sunset with my own camera--a perfect moment of serenity and enchantment under a simple palm tree--with God's sunshine smiling upon all. In honor of the ocean--and all that is beautiful about it--here are some of my favorite quotes. "I'm sailing away, set an open course for the virgin sea. I've got to be free. Free to face the life that's ahead of me." "It's a marvelous thing, the ocean. For some reason when two people sit looking out at it, they stop caring whether they talk or stay silent. You never get tired of watching it. And no matter how rough the waves get, you are never bothered by the noise the water makes by the commotion of the surface. It never seems too loud, or too wild." "The sea, once it casts its spell, holds one in its net forever." "...because there's nothing more beautiful than the way the ocean refuses to stop kissing the shoreline, no matter how many times it's sent away." "The rhythm of my heart is beating like a drum, with the words "I love you" rolling off my tongue. Oh, never will I roam, for I know my place is home, where the ocean meets the sky I'll be sailing."